R. M. Moore, F. Purdy & C. McVea, Saugatuck, MI. Named for Village of Douglas, MI. 1882, Apr 24 Inspected & enrolled Grand Haven, MI. 1882, Oct 6 Owned R. M. Moore & Philetus Purdy, Saugatuck, MI. 1883 Ran Chicago, Saugatuck & Douglas. 1883, Sep 24 Grounded near Saugatuck. 1886 Rebuilt; 2 decks; passenger & package freight; 225 tons; owned Thompson Line, St. Clair, MI. 1889, Dec 16 Owned R. B. & Lewis McElroy, McElroy Transportation Co., Milwaukee, WI; ran Milwaukee & Muskegon; ran Milwaukee - Muskegon. 1892, Jun 12 Collision with & sinking of ALICE E. WILDS off Milwaukee, WI. 1894, Apr 16 Enrolled Marquette; owned Soo Line Railroad Co.; F. D. Underwood, president; may have run Gladstone - Menominee, MI. 1895, Apr 8 Owned John S. Thompson, St. Clair, MI, Cleveland & Oscoda Transportation Co.; Thompson Line with PILGRIM; ran Detroit & St. Clair River to North Lake Huron ports through 1900. 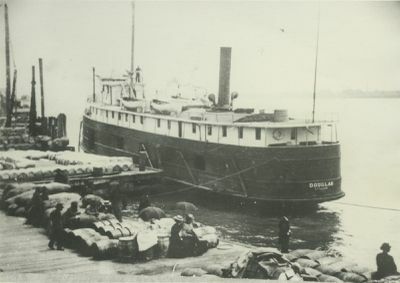 1901 Rebuilt, Marine City or St. Clair as steam barge carring lumber; cabin's removed; 230.46 gross / 123.21 net tons; capacity 200,000 feet lumber. 1907, Jul 31 Grounded Walpole Island, Detroit River. 1907, Oct 31 Sank Lake St. Clair; raised following Mar by Harris Baker. 1908, Sep 25 Owned Harris W. Baker, Detroit, MI. 1914, Apr 16 Owned John Ginzel, Wyandotte; sand & gravel work. 1920, Mar 30 Abandoned, Detroit District.